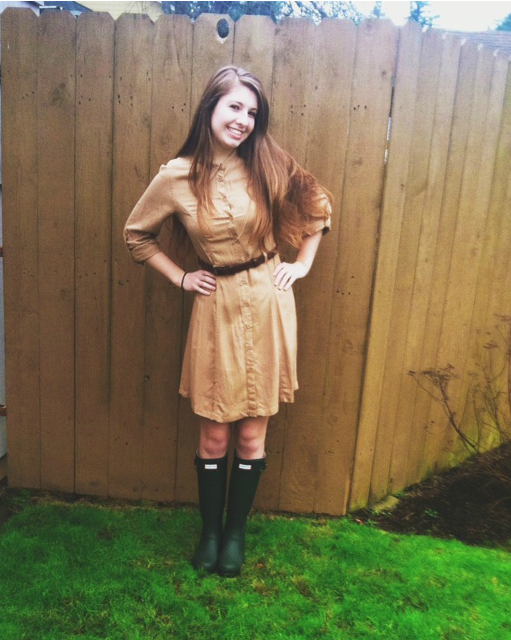 Ever since I had my Hunter Boots, I have been dreaming of outfits to wear with them. 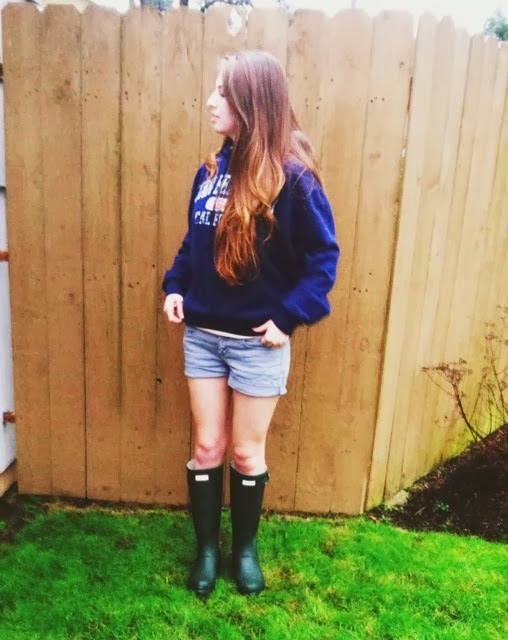 I never realized that Hunter Boots go with every piece of clothing I own, except my slacks but I'm sure I could make my slacks work out with my boots. Who would have thought that a pair of high quality rain boots would be a staple in my closet, that and my The North Face jacket. 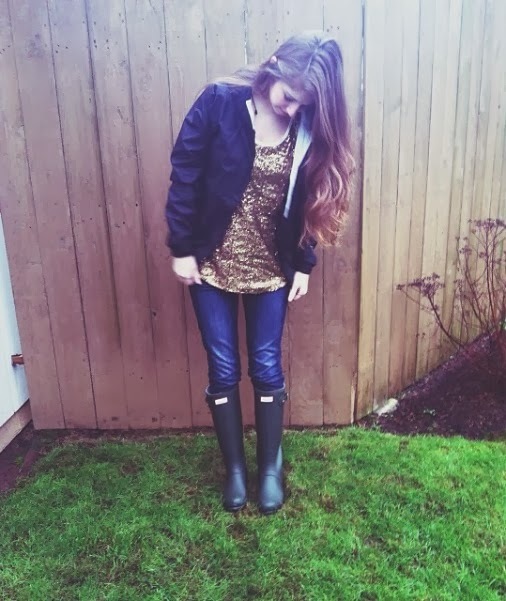 I have put together a few outfits together to show you how easy it is to style your hunter boots. They can go with jeans, dresses, skirts, shorts, anything really! This week was the first week back to school from Christmas break. I wore my Hunter Boots three times this week. The two days I didn't wear them, I felt sad. 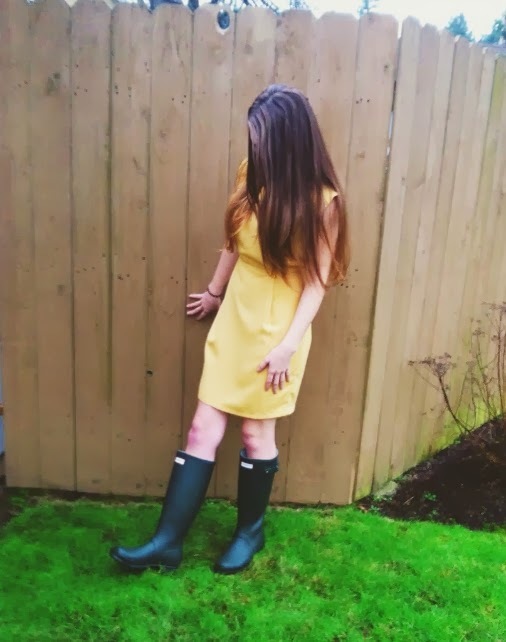 I feel awesome when I wear my Hunter Boots, and since they are such an expensive pair of boots, I feel they should be worn often. Lucky enough, there are lots of combinations you pull off with Hunters. It's basic, simple, and adorable. It's easy to pull off because everybody has a pair of jeans. Easy, and cute. I particularly loved these outfits I wore on Tuesday and Thursday. I wore my sequin top on Tuesday with my Hunter Boots, and on Thursday I wore my floral top with my big "grandma" sweater. It is my biggest sweater, so that is why I call it my "grandma" sweater. I don't wear dresses too often, but every once in a while I will. I will venture and wear the dresses with my boots. They are awesome pieces to pull together an outfit. Here is the "grandma" sweater again. I love it, as you can see. Oh sweaters! What would we do without them? That is so sad to think about. Sporting a "farm girl" look here. I'm glad I chose a color that is neutral, at the same time jazzy. But I want a whole bunch of colors of Hunters. I at least want two more pairs, I like variety. I didn't realize how popular they were! 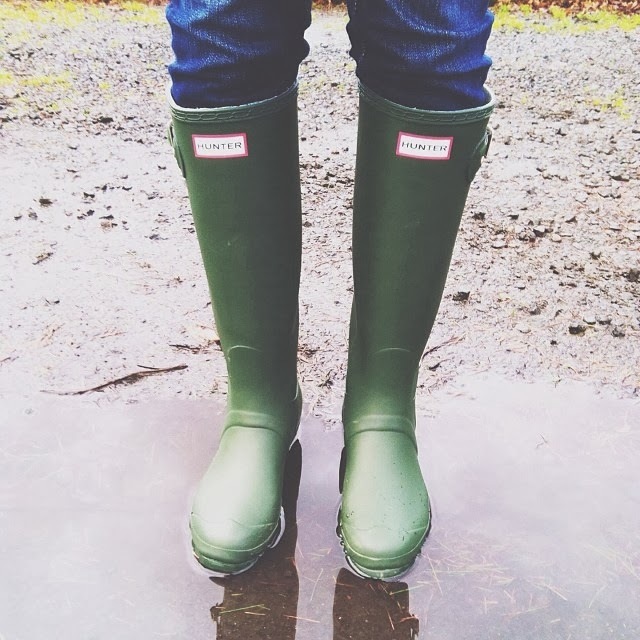 I feel bad for posting so many Hunter Boot pictures on Instagram, but I am kind of obsessed. People seem to like them, so it must not be a bother. 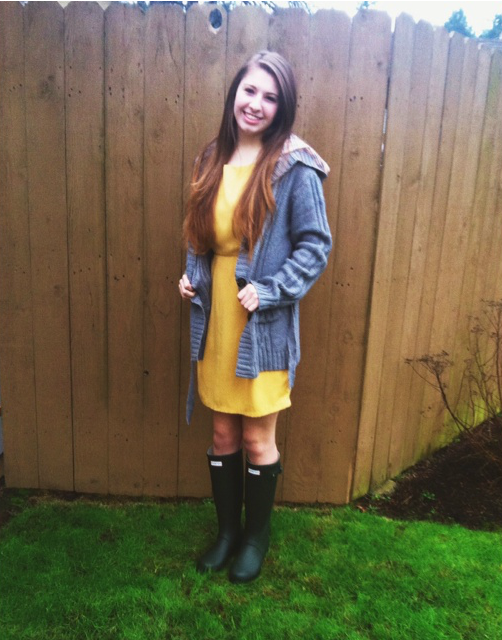 So excited to conjure up more outfit combinations to wear with my boots! 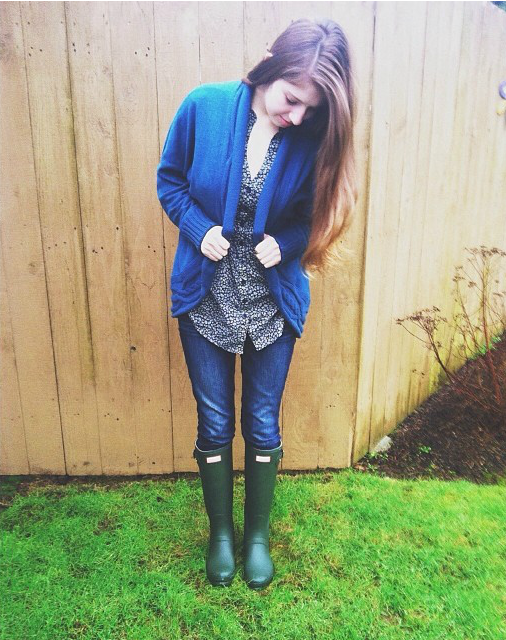 I honestly don't think I could ever out-wear my Hunters. 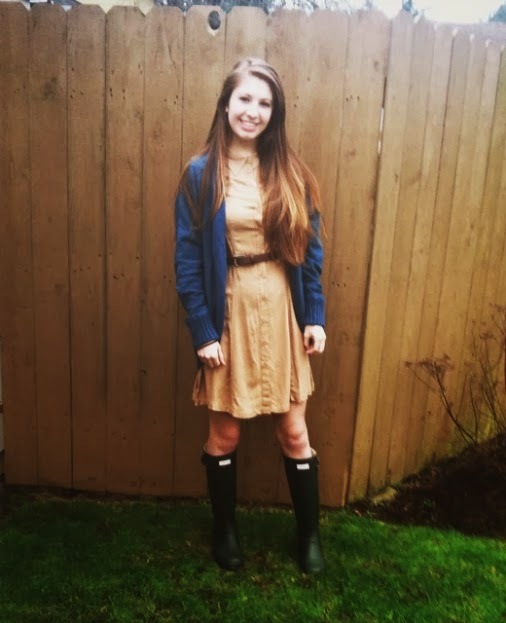 Well, I just wanted to share my recent Hunter Boot style, and I am excited to wear my dresses with my boots in the following weeks. WOW you look really dishy wearing your Rubber Wellingtons makes me want to pull my Wellingtons and join you. Thank you! What color do you have? I love Hunter Wellingtons! I have 2 pairs, Glossy Black and fuchsia Pink, I often wear them when going to work or meeting my friends on a sunny day, I love walking about with my Wellingtons on they are so comfy and look so cute. 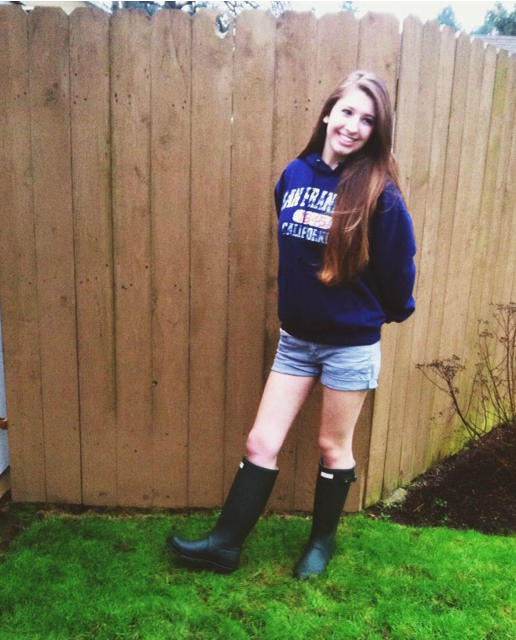 I like to wear my pink Wellingtons with denim Shorts and thin black Tights, a really cool outfit. I like to wear mine with my skinny jeans and boot socks, or leggings with boot socks. I have yet to wear my dresses in public with my boots. I want to get a pair of colored tights to go with them. The next pair I want to get of Hunter Boots is the plum color or the lavender color, or both. I love hunters and I wish I could have more than pair right now, but I am thankful for my one pair for now. WOW Courtney Plum color will be lovely and Lavender would look FAB with thin or patterned black Tights. My first pair of Hunter Wellingtons were green and I wore them to destruction, they lasted about 4 years. My name is Wendy but my friends call me "Welly" because I seem to have my Wellies on every time I meet them. I hope my wellies last a little longer than 4 years. They were expensive and I want them to last. I agree, that is why I want the plum colored. I also want a sky blue color or something pretty like that. I want to try and find some colors that go with everything. I know, I have worn my boots so many times already. They are a lot of fun.